Two members of the K.O.Y.L.I. 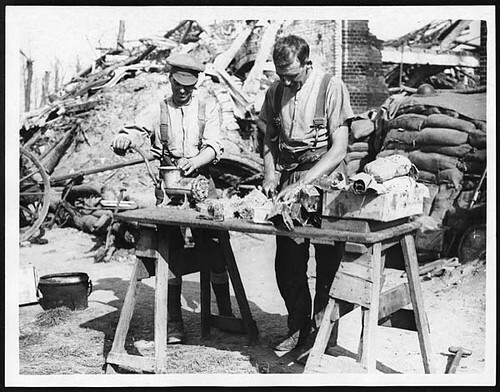 preparing a meal, near Wieltje, Belgium, during World War I. This image shows two men preparing food on a makeshift table. They are standing outside, in front of a ruined building bolstered by sandbags. One man is feeding food, possibly bully beef, into a mincer and turning the handle. As it comes out the other end, the second man appears to be chopping it up. K.O.Y.L.I. Stands for King's own Yorkshire Light Infantry. Whilst in the trenches, the staple food for the men was bully beef (tinned corned beef), bread and biscuits.